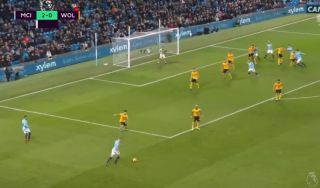 Manchester City star Kevin De Bruyne has forced an own-goal to make it 3-0 against Wolves in the Premier League tonight. See below for a video as the Belgian’s cross found its way in, initially looking like a wonderful effort, but appearing to take a touch on its way past the opposition goalkeeper. This all but wraps things up for Pep Guardiola’s side against Wolves, and helps them continue to pile the pressure onto league leaders Liverpool after their win at the weekend temporarily took them seven points clear at the top.